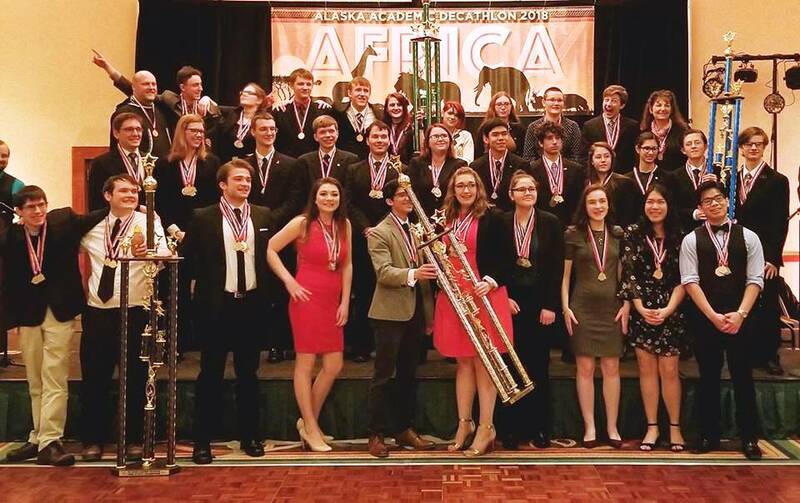 Ketchikan High School’s Academic Decathlon team won the state championship Saturday in Anchorage. They will be headed to the national competition in April. Coach Peter Stanton said this is the first year Ketchikan’s team won at state. “We weren’t counting on it, but we definitely felt that after the results last year, where there were a lot of juniors on the team who were very hard-working, high-scoring, passionate — and then getting second place last year, we definitely felt like we had a chance to win it all this year,” Stanton said. Stanton said that for about 15 years, it seemed, the two Fairbanks schools – West Valley and Lathrop – traded the championship back and forth. He said Lathrop won the two times Ketchikan took second place, including last year. “That really stuck with us, that we still needed to beat Lathrop,” Stanton laughed. And this year, Stanton said, Lathrop came in second. This year’s Academic Decathlon theme was Africa. Stanton said team members received their materials for that theme last May, and started studying over the summer. Eight Ketchikan team members will travel to Texas in April for the national competition. Stanton said he will have each team member focus their studies on their favorite event, in hopes of winning a medal. Stanton said he’s proud of all the students for their hard work, and for making history. Stanton is former Ketchikan High School Academic Decathlon team member. This is his fourth year coaching the team since returning to Ketchikan as a teacher. The eight Ketchikan students who will travel for the national competition are Mackenzie Fousel, Lydia Sumrall, Megan Cornwall, Adrian Ronquillo, Emme Andersen, Charisma Manalo, Largim Zhuta and Max Varela. Below are individual team members’ results from the state competition, according to information from Stanton. Franklyn Correa won a bronze medal is social science. Grant Alphege Dulay won silver in social science. Evelyn Andersen won bronze in science and had the highest total score on Kayhi Team 2. John Luke Calderon won gold in music. Daniel Neufeldt won gold in interview and gold in science. Charisma Manalo won bronze in art. Adrian Ronquillo won bronze in economics, silver in science, silver in social science, and gold in music. Largim Zhuta won bronze in mathematics, bronze in economics, silver in science, and silver in social science. Emme Andersen won bronze in essay, silver in music, gold in art, and earned a $1000 scholarship as the fourth-highest scoring scholastic. Max Varela won silver in economics, silver in social science, earned a $1000 scholarship as the fourth-highest scoring honors, and set a new Kayhi record for highest individual total score with 7,665.3 points. Mackenzie Fousel won silver in art, silver in economics, silver in science, silver in social science, gold in science, gold in music, and earned a $2000 scholarship as the second-highest scoring varsity. Lydia Sumrall won silver in science, silver in interview, gold in art, gold in economics, gold in literature, gold in music, gold in social science, and earned a $4000 scholarship as the highest-scoring varsity.